A white-coated grocer smiles indulgently and hands provisions across the shop counter to a tall be-hatted figure. The customer is dark-coated and his smile is less easy to read: not full enough, and obscured by the broad ebony striations of his face, he has a look of hesitancy at this scene choreographed by a Brownie-wielding photographer. It is the early 1950s and the keeper of the Ripe village shop and Horace Ridler are illustrating a story on the villagers’ acceptance of a curiosity in their midst. I saw that photograph and article a few years ago in a local newspaper’s archive. Quite why the most famous tattooed man of the twentieth century – or of all time – chose to live in East Sussex, it did not say; many of the details of Ridler’s life are vague or lost. 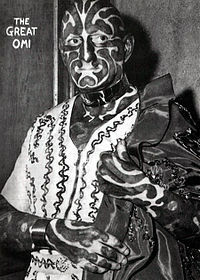 But what is known is that Horace Ridler, better known as the Great Omi or the Zebra Man, retired at the height of his fame in 1950 to a caravan park in Deanland, between Golden Cross and Ripe. Only 10 years earlier he had been touring America with the Barnum and Bailey circus and was reputed to be the world’s highest paid showman. Ridler was born into a wealthy family in 1892 and, as a young man, was commissioned as an officer in the army. He had inherited, but quickly frittered away, his father’s wealth before the age of 22, when he left Britain for active service in the First World War. Despite experiencing some of the horrors of the Mesopotamia campaign, Ridler survived and was demobbed at the end of the war with a small pension and the problem of how to earn a living. Acquiring some crude pictorial tattoos, Ridler found work exhibiting himself at travelling fairs throughout the 1920s; but this was never enough to support him and his wife, Gladys. In 1934 he decided to take drastic action. Subjecting himself to 150 hours of tattooing at the hands of George Burchett of Waterloo Road, London, Horace and Gladys travelled from their suburban home in Mitcham, Surrey three times a week for six months. At the end, Ridler had transformed himself with broad, black stripes over his entire body, face and skull. Augmented with piercings to his ears and septum, filed teeth and native costumes, Ridler became the Great Omi – after Omai, the Tahitian native Captain Cook brought to London in 1774. The effect was instant: Ridler became one of the biggest attractions in England and France, exhibiting himself to thousands. But it was when the Ridlers sailed across the Atlantic in 1939 that his career as the world’s most tattooed man really began. The Great Omi was the star of that year’s World Fair in New York and he spent the next three years touring America and Canada. Wanting to help with the war effort - an unsuccessful attempt to re-enlist with the British Consul in New York had already been made - Ridler returned to Britain in 1942 to entertain the troops and promote government war bonds. After the war, Ridler returned to performance with Gladys as his compere, Omette, and became even more popular in Britain than he had been before. And then at the height of it all, the Golden Cross Caravan Park beckoned. At 6’ 4” tall, and with his alabaster skin accentuated by the thick, black lines of his tattoos, Ridler was an imposing sight; but by the time of his death in 1969 he was a benign and familiar figure in the country lanes around Ripe, heading off to the village store with his shopping bag.